Town in the interior of Morocco, about 35 miles west-southwest of Fez. It contains about 6,000 Jews in a total population of 50,000. But very little is known concerning the Jews there. The town was founded about 940 C.E. As was the case in other parts of Mauritania, it is probable that there were a few Jews in Mequinez before 1492, and that these were joined by many others at the time of the expulsion from Spain. It has been pointed out that of thirty family names in Mequinez at least eighteen, such as "Gozlan," "Toledano," "Pariente," "Sasportas," and "Verdugo," are Castilian in origin. Moreover, various customs, the mode of feminine dress, and the methods of preparing food, all seem to show the influence of the Spanish Middle Ages. 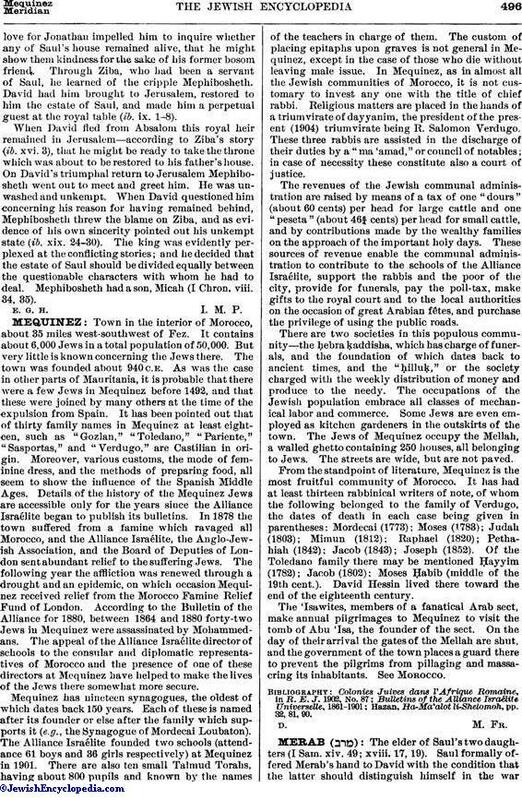 Details of the history of the Mequinez Jews are accessible only for the years since the Alliance Israélite began to publish its bulletins. In 1878 the town suffered from a famine which ravaged all Morocco, and the Alliance Israélite, the Anglo-Jewish Association, and the Board of Deputies of London sent abundant relief to the suffering Jews. The following year the affliction was renewed through a drought and an epidemic, on which occasion Mequinez received relief from the Morocco Famine Relief Fund of London. According to the Bulletin of the Alliance for 1880, between 1864 and 1880 forty-two Jews in Mequinez were assassinated by Mohammedans. The appeal of the Alliance Israélite director of schools to the consular and diplomatic representatives of Morocco and the presence of one of these directors at Mequinez have helped to make the lives of the Jews there somewhat more secure. Mequinez has nineteen synagogues, the oldest of which dates back 150 years. Each of these is named after its founder or else after the family which supports it (e.g., the Synagogue of Mordecai Loubaton). The Alliance Israélite founded two schools (attendance 61 boys and 36 girls respectively) at Mequinez in 1901. There are also ten small Talmud Torahs, having about 800 pupils and known by the names of the teachers in charge of them. The custom of placing epitaphs upon graves is not general in Mequinez, except in the case of those who die without leaving male issue. In Mequinez, as in almost all the Jewish communities of Morocco, it is not customary to invest any one with the title of chief rabbi. Religious matters are placed in the hands of a triumvirate of dayyanim, the president of the present (1904) triumvirate being R. Salomon Verdugo. These three rabbis are assisted in the discharge of their duties by a "ma'amad," or council of notables; in case of necessity these constitute also a court of justice. The revenues of the Jewish communal administration are raised by means of a tax of one "dours" (about 60 cents) per head for large cattle and one "peseta" (about 46¾ cents) per head for small cattle, and by contributions made by the wealthy families on the approach of the important holy days. These sources of revenue enable the communal administration to contribute to the schools of the Alliance Israélite, support the rabbis and the poor of the city, provide for funerals, pay the poll-tax, make gifts to the royal court and to the local authorities on the occasion of great Arabian fêtes, and purchase the privilege of using the public roads. There are two societies in this populous community—the ḥebra ḳaddisha, which has charge of funerals, and the foundation of which dates back to ancient times, and the "ḥilluḳ," or the society charged with the weekly distribution of money and produce to the needy. The occupations of the Jewish population embrace all classes of mechanical labor and commerce. Some Jews are even employed as kitchen gardeners in the outskirts of the town. The Jews of Mequinez occupy the Mellah, a walled ghetto containing 250 houses, all belonging to Jews. The streets are wide, but are not paved. From the standpoint of literature, Mequinez is the most fruitful community of Morocco. It has had at least thirteen rabbinical writers of note, of whom the following belonged to the family of Verdugo, the dates of death in each case being given in parentheses: Mordecai (1773); Moses (1783); Judah (1803); Mimun (1812); Raphael (1820); Pethahiah (1842); Jacob (1843); Joseph (1852). Of the Toledano family there may be mentioned Ḥayyim (1782); Jacob (1802); Moses Ḥabib (middle of the 19th cent.). David Hessin lived there toward the end of the eighteenth century. The 'Isawites, members of a fanatical Arab sect, make annual pilgrimages to Mequinez to visit the tomb of Abu 'Isa, the founder of the sect. On the day of their arrival the gates of the Mellah are shut, and the government of the town places a guard there to prevent the pilgrims from pillaging and massacring its inhabitants. See Morocco. Hazan, Ha-Ma'alot li-Shelomoh, pp. 32, 81, 90.